Chickpeas, also known as garbanzo beans, have been one of the Mediterranean's staple legumes for over 7,000 years and are believed to have been the first legume cultivated by man in the Neolithic period. Popular in Roman times, their modern Italian name ceci derives directly from the Latin cicer, and Italy's enduring love for chickpeas is reflected in the many traditional regional recipes based on whole, ground, or pureed beans. First-time visitors to Italy are often surprised at the diversity found in authentic Italian cuisine, as many think exclusively of pasta and pizza when they think of Italian food. Historically, however, much of Italy was relatively poor and rural until the mid-20th century, and families in the countryside survived on protein-rich legumes throughout the winter months. Stewed chickpeas flavored with a bit of pork fat and mixed with winter greens, dried chickpeas ground into flour to make both sweet and savory dishes, pureed chickpeas mixed with cocoa or honey to form a rich, smooth filling for sweets...you can find chickpeas featured in a wide variety of dishes in almost every region of Italy. It's a new year, and Italy would like to bring your attention to a new unsung “Cultural Capital” over the next 12 months. Cultural Capitals are small, jewel-like cities that have less star power than Venice or Florence, but offer their own understated beauty and artistic and architectural treasures to discover. Last year, the honor fell to the “Sleeping Beauty” of Mantua, a beautiful Renaissance center and UNESCO World Heritage Site between Milan and Venice, and this year the fêted city is the Tuscan town of Pistoia, just half an hour outside Florence at the foot of the Apennine mountains. Christened “La Città dei Crucci”, or “City of Sorrow”, by Gabriele D’Annunzio, Pistoia has long had a reputation for being particularly contentious, with its residents embroiled in protracted battles between warring factions and families for centuries. “I love you, city of sorrow, bitter Pistoia,” wrote D'Annuncio, “blood of the Whites and the Blacks, that turns red before your proud people, men of ideology, with ancient joy.” Today, rather than bitterness and blood, you'll find Pistoians harbor a fierce civic pride and enduring affection for their home town. 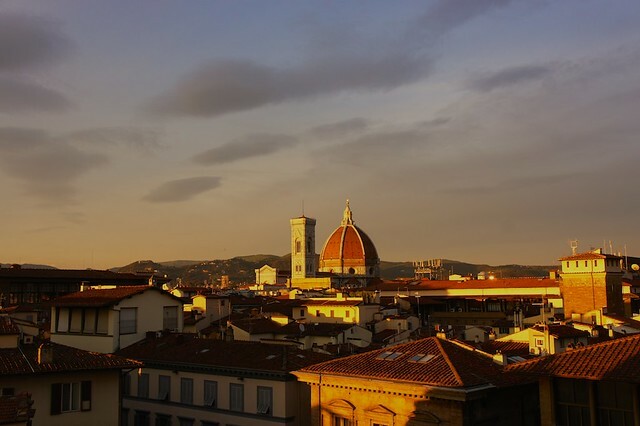 Pistoia has grown in popularity over the past few years, as visitors to Florence look to escape the crowds in Tuscany's capital city by venturing out to the relative peace of the nearby provincial towns for day trips and overnights. If there was ever a time to visit Pistoia's pretty piazzas, elegant churches, and world-class museums, it is 2017...the calendar is full of special cultural events, exhibitions, and concerts and the center has been spruced up and is ready to receive travelers curious to explore one of the most charming small cities in Tuscany. Valentine's Day is just around the corner, and everyone over the age of 8 who is in a relationship is feeling the pressure of choosing the perfect gift to celebrate their love. From a classic understated box of chocolates to an over-the-top showstopper classic car, nothing gives more pleasure than knowing you have found that one thing that will make your sweetheart smile. Unfortunately, research has shown that the thrill of a new possession fades quickly. Instead, the pleasure of an experience, especially one shared as a couple, lasts much longer. Rather than a gift that can be wrapped in a bow, this year think “outside the box” and opt for something that will make memories to last a lifetime. In short, diamonds are neither a girl's best friend nor forever, but a vacation in Italy and the memories made during your trip can be both of those things!